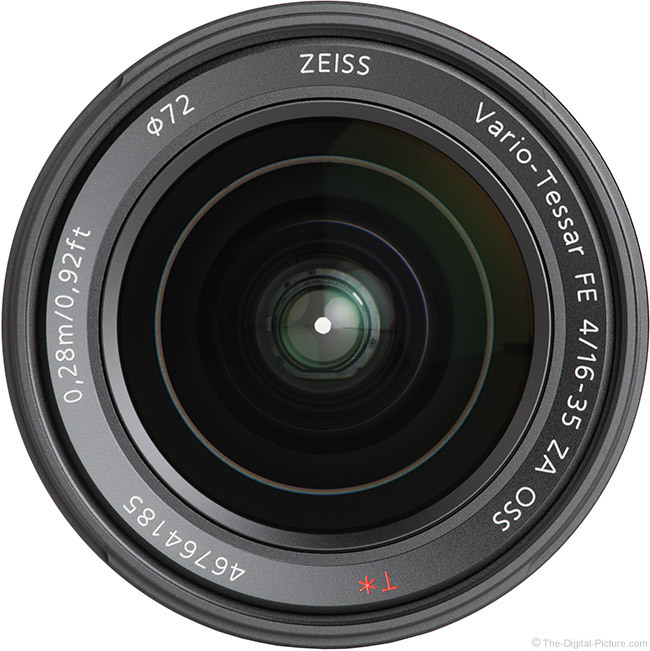 The Sony Vario-Tessar T* FE 16–35mm F4 ZA OSS Lens has a number of excitement-inducing attributes. First up is the relatively small size and light weight for a lens with this one's specs, making it a great match to the compact Sony alpha cameras it mounts to. Great Zeiss build quality, including a metal exterior, with a sleek, sharp-appearing design is another very positive trait. This lens delivers sharp image quality with Optical SteadyShot (OSS) aiding this factor and increasing the versatility of this lens. Add in a much-used focal length range and you have a lens that will be mounted to the camera a significant percentage of the time. Put a moderate price tag on this feature package and you have a very desirable lens option for the kit. When starting a kit, most will first select a general purpose lens. 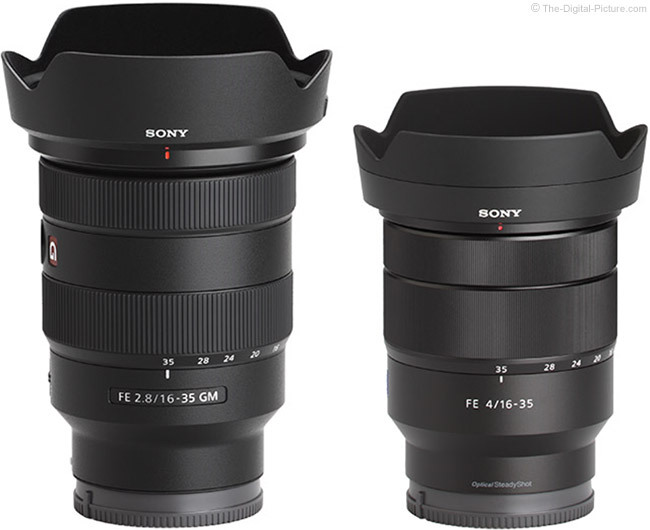 The Sony FE 16-35mm f/4 ZA OSS Lens matches especially well with the Sony FE 24-70mm f/4 ZA OSS Lens and the Sony FE 24-70mm f/2.8 GM Lens is also an excellent general purpose lens choice. For most, the next-most-needed lenses is a wide-angle zoom and this lens' 16-35mm range ideally covers that need, filling in the angles of view wider than the general purpose choice. The 107° angle of view provided by a 16mm focal length is ultra-wide and all of the narrower angles of view down to 63°, just modestly-wide, are included. One of the most popular uses for this range is, as illustrated above, landscape photography. I'll take any excuse I can find to get out for this purpose and this focal length range is perfect for this park and a huge number of other beautiful places. One of the capabilities a wide angle lens has is to make a foreground object (ideally something interesting or attractive) appear large in relation to a distant, yet in-focus, and equally-attractive background. 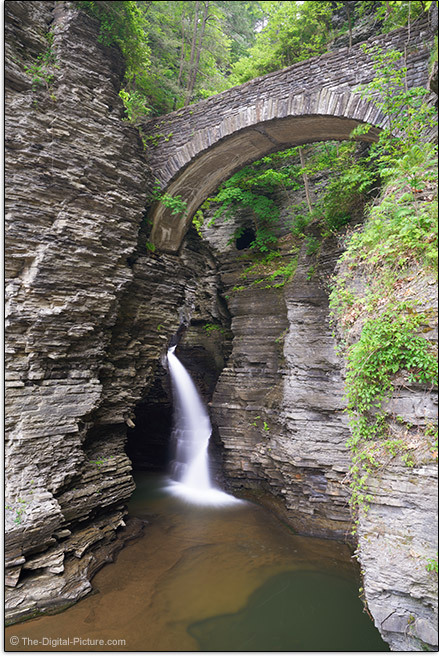 In the 21mm example above, the very small foreground waterfall is close to the lens and the much-larger Oneida Falls is in the distant background. The final wide angle result is that they all appear to be similar in size. Another highly-desired aspect is that all details in the frame are in sharp focus (unless intentionally motion-blurred). Ultra-wide images feature lots of background in the frame. Thus, careful attention must be paid to composition making use of the ultra-wide angles of view. I generally find excellent ultra-wide compositions more difficult to create than normal or telephoto compositions, but when the right scene is found, ultra-wide results are highly rewarding. Start looking for a beautiful bunch of flowers in front of a large mountain range (perhaps with a lake between them) to utilize these concepts. 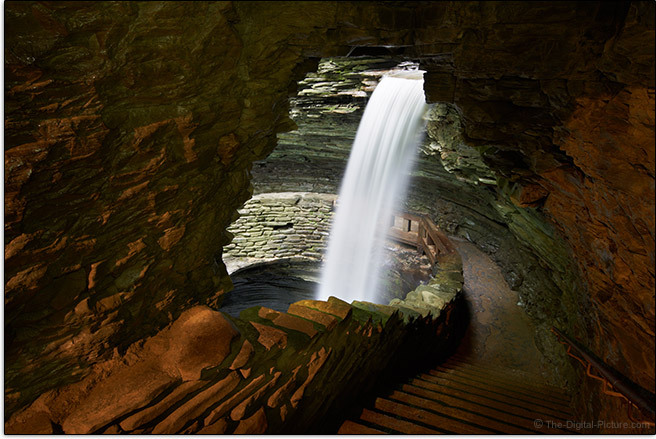 While a close-up wide-angle perspective can look great in a landscape scene, it is generally to be avoided when a person is the primary subject. What you do not (usually) want appearing large in the foreground of your ultra-wide composition is a person's nose. We don't typically look at people from really close distances (that other person will become uncomfortable with us being in their personal space) and when we look at photos of people captured from these distances, certain body parts (usually the nose) start to look humorously large. Unique portrait perspectives can be fun, but this technique should not be overused as it gets old quickly – and your subjects may not appreciate it. Get out the telephoto lens for your tightly-framed portraits. That said, this is still a great lens choice for photographing people. Simply move back and include your human subject in a larger scene for an environmental portrait. The only moderately-wide 35mm focal length is a great choice for full-body portraits and this focal length range also nicely handles small up to very large groups. The 16-35mm focal length range is a great option for the wide work at a wedding, at family gatherings and other events as well as for photojournalism and some sports photography needs. This focal length range works very well for architecture, interior and real estate photography. The real estate use helps us circle back to the landscape capabilities of this focal length range and the landscape after dark, more-narrowly described as nightscape, is a frequent use of 16-35mm (though this lens' f/4 aperture is somewhat narrow for this use). Also count cityscapes on this lens' great uses list. Going underwater? The 16-35mm focal length range is a great choice for aquatic adventures utilizing an underwater housing, allowing close distance framing of your subject, minimizing the image degradation caused by water clarity issues. Use this lens for shooting in a vehicle, inside of a large product ... and in far more situations than I am prepared to list right now. 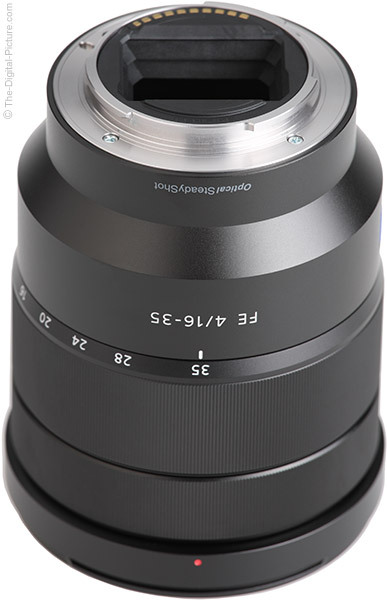 For those with primary needs dictating wider angles of view, a 16-35mm lens could even be a good primary general purpose lens and this is especially the case for use on 1.5x/APS-C format cameras where this lens provides a very-general-purpose 24-52.5mm full frame angle of view equivalent. Sorry that this review has taken me a bit longer than usual to complete, but I've been having a bit too much fun using the lens in the field. We spent a great day together in Watkins Glen State Park and another in Ricketts Glen State Park. 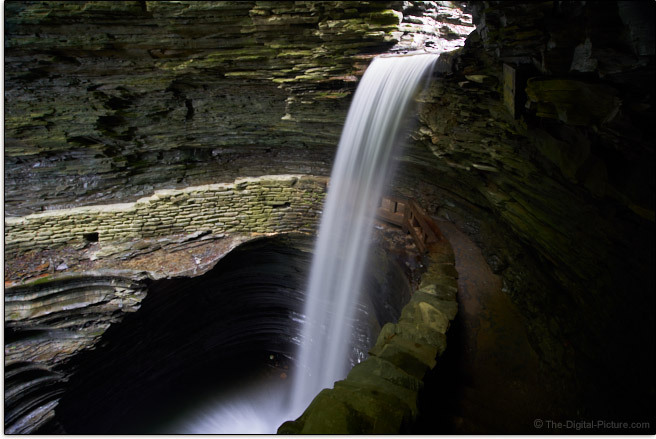 The Sony a7R III and FE 16-35mm f/4 ZA OSS Lens were a perfect combination for these hikes. Basically, this lens takes you from a very wide angle of view to not very wide when used on a full frame camera body and from wide to normal/standard on an APS-C body. The f/4 in the lens name refers to the lens' max aperture opening, the relationship of lens opening to focal length. The lower the number, the more light the lens will allow to reach the sensor. Each "stop" in aperture change (examples: f/2.8, f/4.0, f/5.6, f/8, f/11) increases or reduces the amount of light reaching the sensor by a factor of 2x (a big deal). An f/4 lens is one stop slower than what is typically found in the fastest zoom lenses covering this focal length range. A 1-stop narrower max aperture means that less glass is needed, resulting in lighter weight, smaller size and lower cost. A 1-stop narrower max aperture also means that there may be better options for stopping action in low light. I emphasize "action" as this lens' image stabilization system (discussed soon) makes this lens well-suited to handheld low light non-action photography. I'll call this lens' f/4 max aperture moderately fast. This lens can handle moderately low light scenarios, especially with the low-noise technology featured in the latest cameras. Again falling behind the f/2.8 variants is this lens' ability to produce a strong background blur. Those looking for the strongest background blur possible will not be targeting wide angle focal lengths, but the 35mm f/4 combination along with a close subject and distant background are able to create some subject separation using blur. 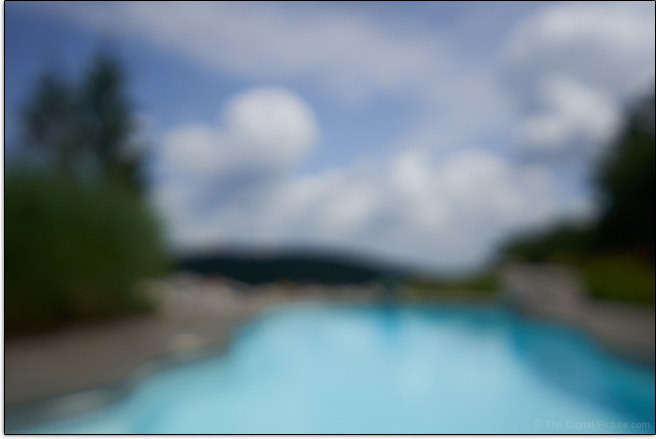 Following are examples of the maximum background blur this lens can produce. That this lens has the f/4 maximum aperture opening available over the entire focal length range is a positive attribute and wide open aperture exposures can be counted on throughout the entire zoom range. 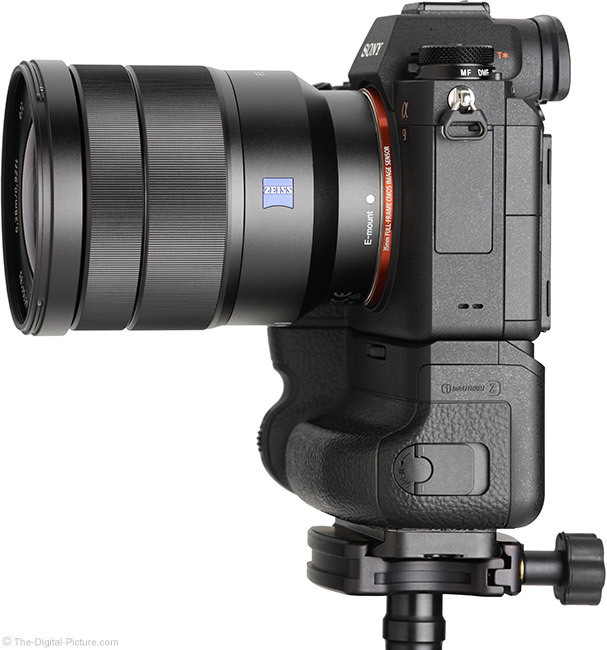 Sony cameras are marketed as having IBIS (In-Body Image Stabilization), but many of their lenses, including this one, also feature OSS (Optical SteadyShot) with these two stabilization systems being complementary. 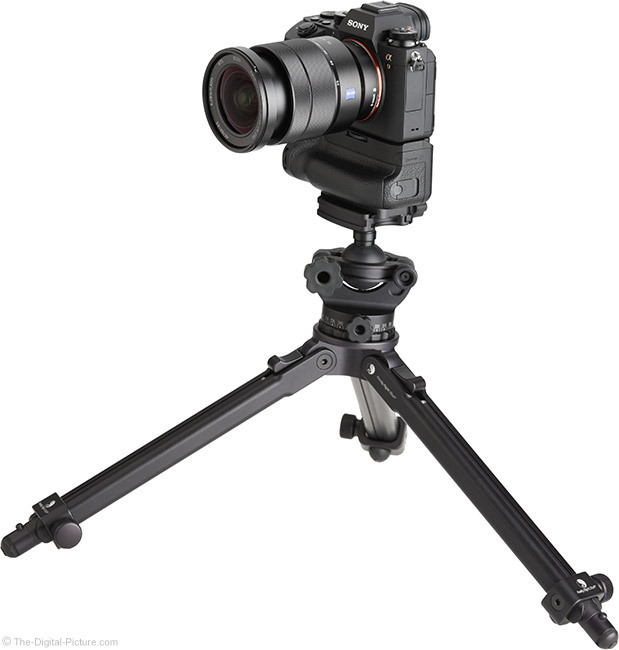 "5-axis image stabilization becomes available when used with α series bodies that feature built-in image stabilization." 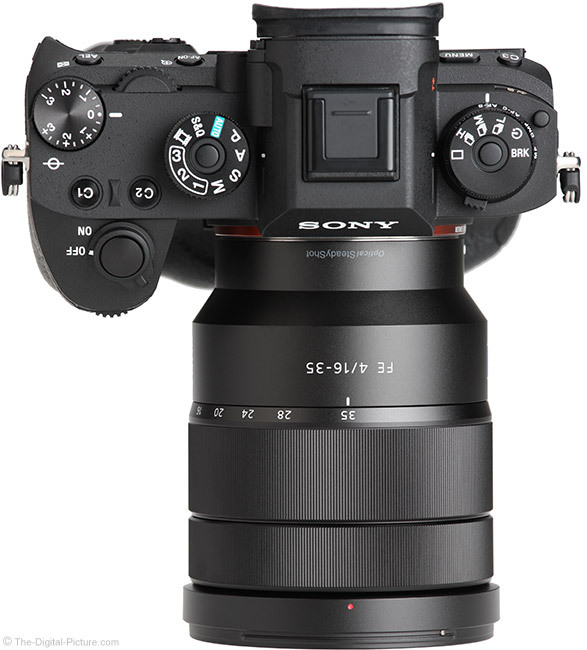 [Sony] While the f/4 wide aperture alone does not make this lens a great choice for low light photography, this lens' optical image stabilization system greatly aids in its low light proficiency, significantly increasing the lens' versatility, improving usability and, in many situations, greatly improving the image quality it delivers. A number of stops of assistance rating is often provided by a manufacturer and Sony rates this one at 4 stops. Shooting handheld (elbows not resting on my body) under ideal conditions (indoors on concrete), using a Sony a7R II, most of my 16mm images were sharp at 1/4 second shutter speeds with a slow taper in the sharp percentage rate until only infrequent sharp images were delivered at .5 seconds. A longer focal length magnifies motion more but results at 35mm were not much different than at 16mm with an about 1/3-2/3 stop shorter exposure needed on average. 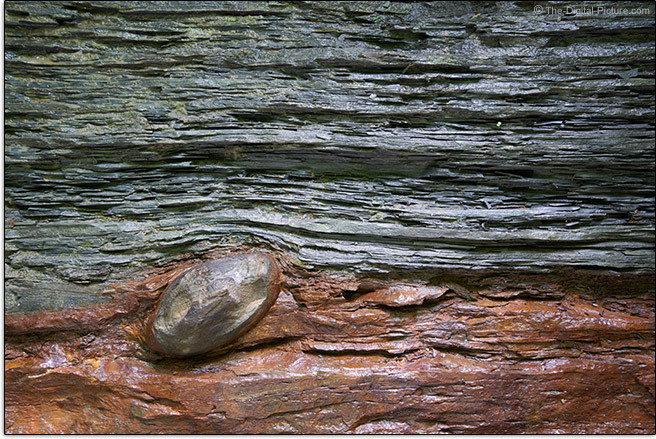 Photographing outside, perhaps in the wind or on unstable footing? Expect to need faster shutter speeds than those I reported. But, also expect a similar amount of assistance from OSS as it is still similarly and significantly compensating for shake. Usually, a tripod will give you at least the same benefit. However, it is not always convenient to carry and use a tripod and working handheld is usually much faster, allowing images to be captured that otherwise would have been missed. I often tout the stabilized viewfinder benefit of image stabilization and how that benefit aids in precise framing of compositions. This lens offers that feature, but the benefit is far lower for a wide angle lens than a telephoto lens. This is a very well-designed image stabilization system. While this lens' OSS is active, drifting of framing is not an issue and the viewfinder image remains well-controlled, not jumping at startup/shutdown and subject reframing being quite easily accomplished. This OSS system is one of the quietest image stabilization systems I've used. In a quiet room with my ear nearly against the lens, I can hear only a very faint whir. Handheld video recording is nicely assisted by OSS and the stabilized composition also provides a still subject to the camera's AF system, permitting it to do its job better. In the owner's manual, Sony usually recommends turning OSS off when using a tripod. This subject is omitted from this lens' owner's manual, but I suggest turning it off as usual. There are many important features for a lens to have for certain situations, but image quality is a feature that matters for every image. And, image sharpness, a combination of contrast and resolution, is typically right at the top of the image quality feature importance list. With one notable exception, this lens has exceptional sharpness. Wide open at 16mm, the Sony FE 16-35mm f/4 ZA OSS Lens is an impressively sharp lens, delivering sharp details from full frame corner to full frame corner. Stopping down to f/5.6 brings on only a touch of improvement and most would not even find that slight enhancement needed. Stop down to f/8 only if more depth of field is needed. At 20mm, the results are similar. Results at 24mm trail those at wider angles, but only by a very slight amount. I can see slightly more improvement at f/5.6 at this focal length, but the results are still really nice. At 28mm, another very slight decline in sharpness is seen with slightly more improvement showing at f/5.6. At 35mm the FE 16-35mm f/4 appears to turn into a different lens and not in a good way. Check out this 35mm vs. 20mm comparison to see what I'm talking about. Stop down to f/5.6 at 35mm for a very substantial improvement in sharpness with center and mid-frame results then appearing similar to 28mm f/4 results. With f/8 bringing only a slight improvement at 35mm, this focal length does not become totally razor sharp, but decent. 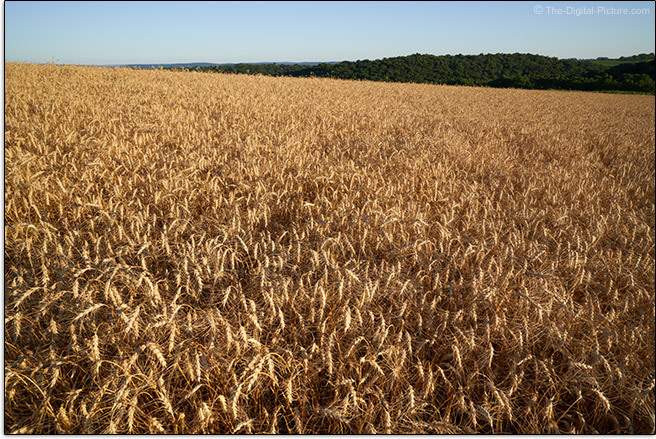 Below you will find sets of 100% resolution crops captured in uncompressed RAW format using a Sony a7R II. The images were processed in Capture One using the Natural Clarity method with the sharpening amount set to only "30" on a 0-1000 scale. These examples are from the center of the frame. The 16mm and 24mm results are quite impressive, the 35mm f/5.6 results are decent and the 35mm f/4 combination should be completely avoided. Sharpness testing with aperture step-downs made between captures usually reveals any focus shift issues and this lens does not have that problem, even in testing designed specifically to show this. If you want to see the worst-case image quality performance from a lens, look in the corner of the frame. 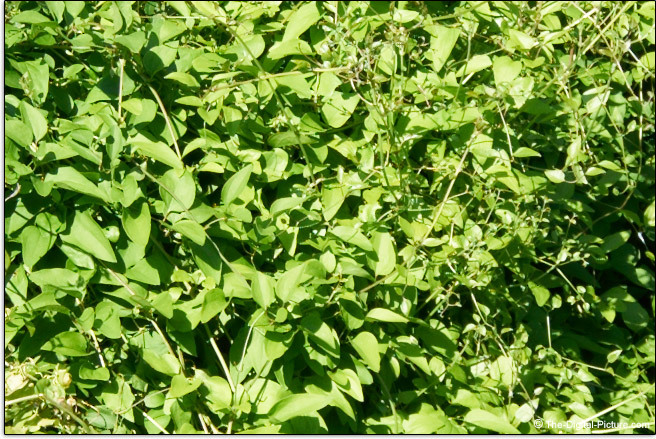 Below are 100% crops taken from the extreme bottom left corner of images captured and processed similarly to the above. Especially for an ultra-wide angle zoom lens, the corner results at 16mm f/4 are impressive. At 24mm, a bit of haziness appears and stopping down to f/5.6 brings on the impressiveness label. At 35mm, f/4 results are blurry, f/5.6 results are much improved and the f/8 results are very good. 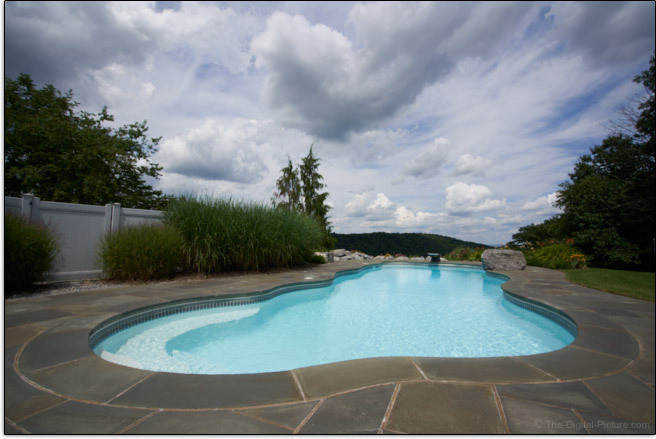 Corner image quality is not always important, but especially for landscape purposes, it is very important. You likely noticed the 16mm f/4 corner sample appearing darker than many of the others. This lens shows about 3 stops of shading in the corners at this focal length. Stopping down to f/5.6 eliminates about 1 stop, but about 2 stops, a usually noticeable amount, remains present through f/16. Wide open vignetting is reduced to about 2 stops at 24mm and to just slightly less by 35mm. At f/5.6, about 1.5 stops of corner shading shows in the mid focal length range and slightly less shows in the long range corners. Again, expect little improvement from stopping down to apertures narrower than f/5.6. This lens' peripheral shading performance is underwhelming. Vignetting can be corrected during post processing with increased noise in the brightened areas being the penalty or it can also be simply embraced, using the effect to draw the viewer's eye to the center of the frame. 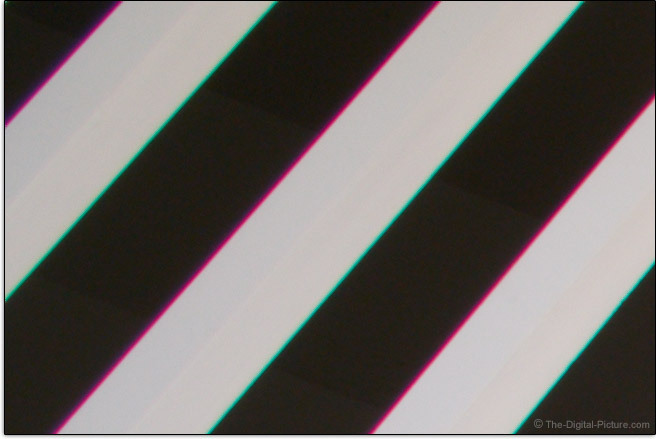 The effect of different colors of the spectrum being magnified differently is referred to as lateral (or transverse) CA (Chromatic Aberration). Lateral CA shows as color fringing along lines of strong contrast running tangential (meridional, right angles to radii) with the mid and especially the periphery of the image circle showing the greatest amount as this is where the greatest difference in the magnification of wavelengths exists. Zoom lenses, especially affordable ones, generally have Lateral CA and Lateral CA is generally worst at the two ends of the focal length range. 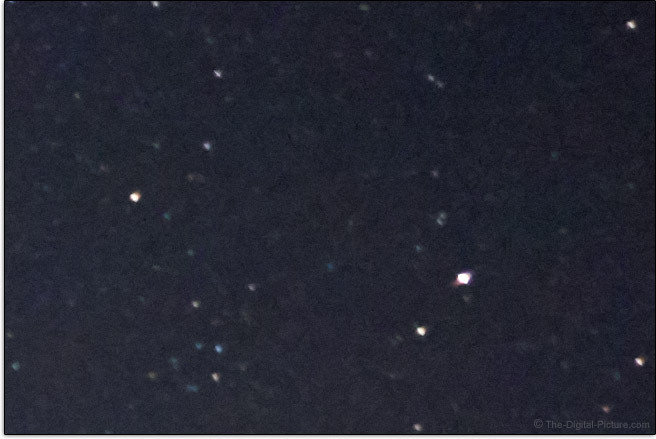 Following are 100% crop worst-case examples taken from the extreme upper-left corner of full frame images. There should be only black and white colors in these images and the additional colors are showing lateral CA. The lateral CA at 16mm is right up there with some of the strongest I've seen and the improvement in the midrange focal lengths, where many zoom lenses typically become nearly neutral in this regard, is small. If I stopped with the first sample set, probably few would buy this lens. Fortunately, lateral CA is easily software corrected by radially shifting the colors to coincide. The second set of images are from the same RAW files as the first set, only processed with Capture One's lateral CA correction enabled, set to auto. The difference is dramatic, although the edge of the frame should be cropped slightly to remove the peripheral correction issues. In the real world, lens defects do not exist in isolation with spherical aberration and spherochromatism generally found, at least to some degree, along with axial CA. These combine to create a less sharp, hazy-appearing image quality at the widest apertures. 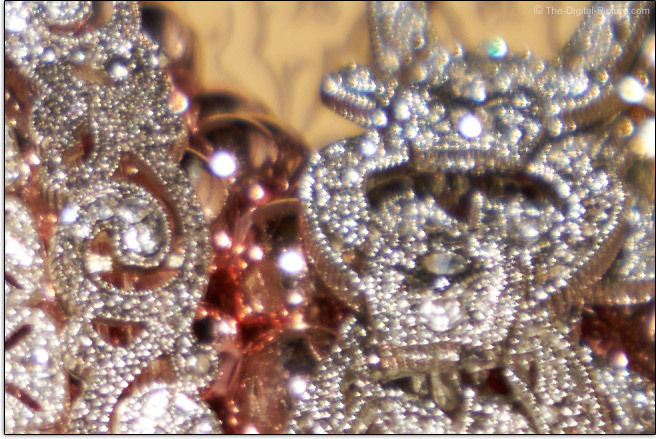 I like to photograph silver-colored jewelry to bring out these defects. 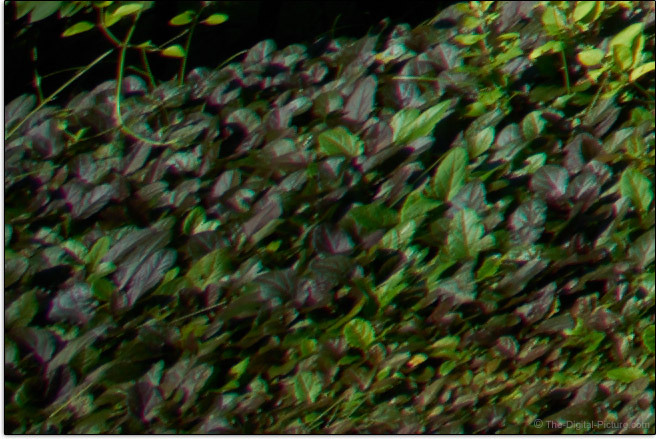 The foreground and background out of focus specular highlights showing similar peripheral colors illustrates this lens performing well in this regard. 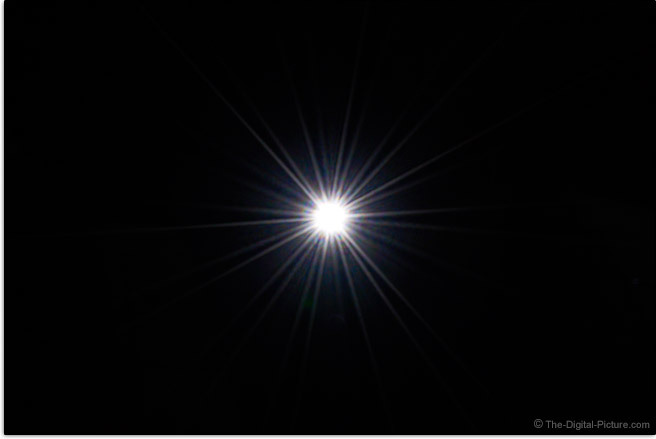 Stellar is this lens' flare resistance, aided in part by the Zeiss T* lens coating. Even at f/16 with the sun in the corner of the frame, this lens shows very few flare effects. The following samples are 100% crops from the extreme top right of Sony a7R III frames. While not perfect, these results are, relatively speaking, not bad. Geometric distortion is a lens attribute that is pixel-level destructive to correct and we always evaluate for this. At 16mm, the FE 16-35mm f/4 ZA OSS lens shows modest barrel distortion. By 20mm, the distortion profile has moved slightly into the pincushion range and pincushion distortion increases until becoming modest at 35mm. Those familiar with ultra-wide angle geometric distortion profiles are not surprised as these results are not unusual. Those looking for a strongly blurred background do not typically choose ultra-wide angle focal lengths, but ... here is a closer look at the quality of the background blur this lens can produce. The first set of results shows 100% crops of f/8-captured images with specular highlights in the background blur. While these highlights are rather round, the centers are not especially smooth. With a stronger blur tuned in, the backgrounds of the outdoor-captured images appear decent. This lens has 7 rounded aperture blades and when stopped down, these typically produce 14-point stars from point light sources. This lens doubles each of those 14 points for a decent-appearing result. I find the quality of the starburst most important when photographing landscapes with the sun in the frame (perhaps just slightly visible behind a subject such as a tree) and when photographing cityscapes after the lights come on. While vignetting, lateral CA and 35mm f/4 sharpness are image quality drawbacks for this lens, most will find that these defects can all be easily worked around and overall, this lens is a great performer, especially in regards to the widest focal lengths where this lens will most often be utilized. 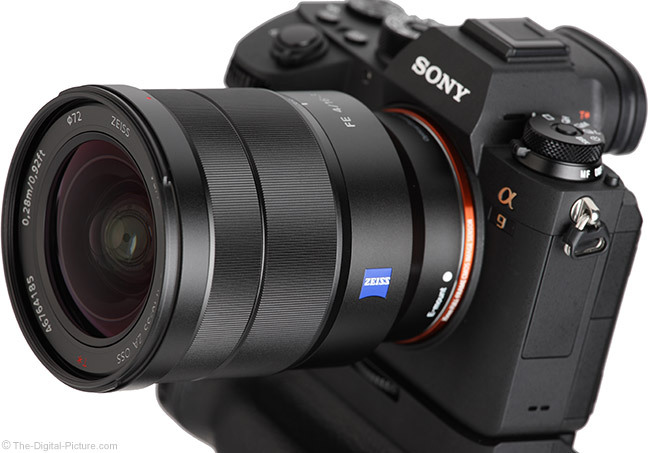 The Zeiss-made Sony FE 16-35mm f/4 ZA OSS Lens is a high-grade model and high-grade lenses typically get premium AF systems. That norm holds true with this lens. Of utmost importance for an AF system is accuracy and the 24-70 ZA consistently focuses very accurately, generating a high confidence level in its capability. A linear autofocus motor internally drives this AF system very quickly. While the speed of focusing is in part the lens' responsibility, the camera also plays a role and currently, Sony cameras de-focus the lens slightly before focusing on the subject when in AF-S single shot focus mode, even if focusing at the same distance with the same subject. Even when the lens focuses very quickly, the camera sending it on a hunt significantly impacts the overall focus speed. Switch to AF-C continuous focus mode and focus acquisition speeds are much faster. This lens' motor can drive AF very fast and with the defocus-then-focus routine gone in this mode, the experienced AF speed is much faster. Why shouldn't AF-C mode be used all of the time? AF accuracy is sacrificed with a lower frame-to-frame focus accuracy consistency being realized with a still subject. For the current Sony FE-compatible cameras, this lens focuses very quickly relative to other FE lenses. Perhaps some like an audible AF system for confirmation that AF is actually happening, but most of us prefer our cameras to be silent when focusing and this lens has that feature. Some light shuffling can be heard in the lens during AF, but it can only be heard in an quiet environment with an ear next to the lens. This lens focuses very quietly. With no AF/MF switch provided, this lens relies on the camera's menu system for that feature. That is one less part to fail, but as I've said before, I'd rather have the switch. 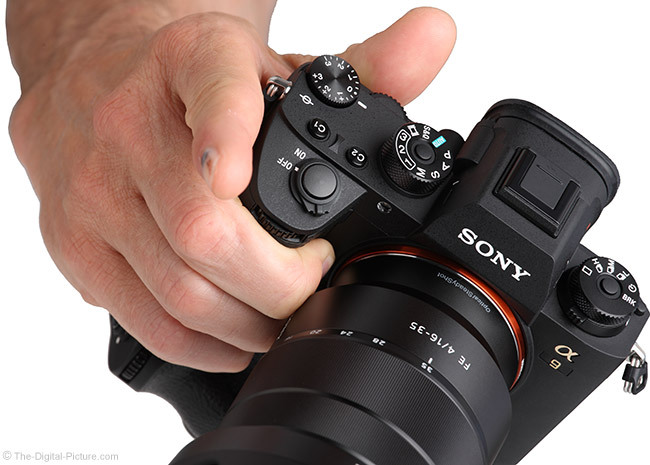 Sony supports FTM (Full Time Manual) focusing via the DMF (Direct Manual Focus) AF mode. The manual focus ring is nicely sized relative to the overall size of the lens. The ring is very smooth, nicely (on the light side) dampened and the slow rotation speed is just right for precise manual focusing at all distances. This is a focus-by-wire AF system and faster rates of focus distance change initiate higher speed focus distance adjustments. While I typically dislike these designs, this implementation works well, with enough rate change needed to make the speed shift change happen more intentionally. Only a short rotation of the focus ring is required to go from minimum focus distance to infinity if the ring is turned fast. While a distance window is not provided, a focus distance meter shows in the lower portion of the electronic viewfinder during manual focusing. Of course, the camera must be powered on to see that meter and to adjust focus distance. Also, don't count on the distance numbers for accuracy. At its 11.0" (280mm) minimum focus distance, this lens can create a 0.19x maximum magnification. That number isn't too exciting, but it's not too bad either. The Canon and Nikon options have noticeably higher numbers. Figure an about 6.6 x 4.4" (168 x 112mm) subject filling a full frame viewfinder with this lens focused to minimum focus distance at 35mm. Magnification from wide angle focal length lenses is generally very significantly increased with the use of extension tubes which are basically as their name implies, hollow tubes (with electronic connections) that shift a lens farther from the camera. Doing so allows the lens to focus at closer distances, though at the expense of long distance focusing. Sony does not publish extension tube specs nor do they offer extension tubes as of review time. You'll have to choose a third party extension tube if this feature is desired. A Zeiss logo is featured on the left side of this lens and like the other Zeiss-built Sony lenses, this one is very nicely built. This is a very smoothly-shaped lens featuring a great-looking, great-feeling semi-gloss black all-metal barrel exterior with etched focal lengths and other markings. Zoom from 35mm out to 16mm and, especially in the wider portion of the range, this lens extends, though only by 0.65" (16.5mm) at most. 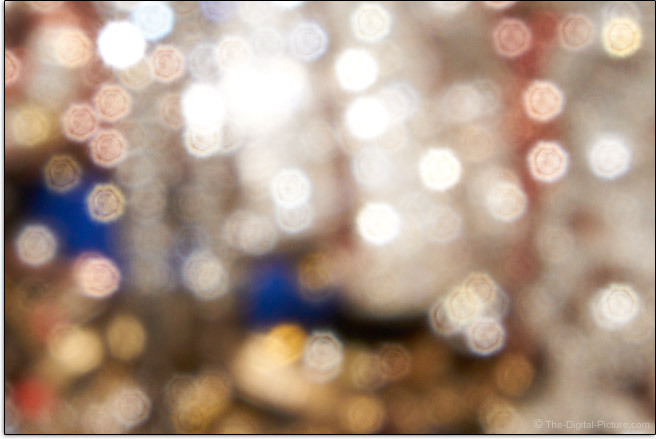 There is a slight amount of play in the extended portion of the lens. The metal zoom ring is very smooth and the 70° rotation makes selection of any focal length fast and easy. 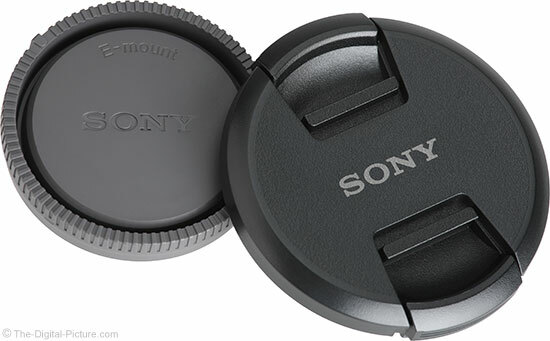 This is another switch-less Sony lens design. I personally miss having AF/MF and image stabilization switches. The switches are much faster to use and it is easier to visually confirm settings by looking at the lens than finding the menu options. Of course, it is harder to inadvertently change a menu setting than move a switch and switches add cost and moving parts which could also be a source of failure. Sony claims that this lens has a "Dust and moisture-resistant design", but raising a red flag is that the rear mount is not gasketed. That seems a rather large omission for reasonable sealing and I strongly suggest using a rain cover when working in (potentially) wet or dusty environments with this lens. This lens has a small size and light weight relative to other brand alternatives, nicely matching to Sony's compact mirrorless cameras in these regards. Still, the diameter of the lens is such that my knuckle is cramped by Sony's compact camera grips with my knuckle uncomfortably pressing into the rear of the lens. Otherwise, this lens' mostly-straight exterior design is comfortable to use and the light weight makes this one comfortable to carry for very long periods of time. 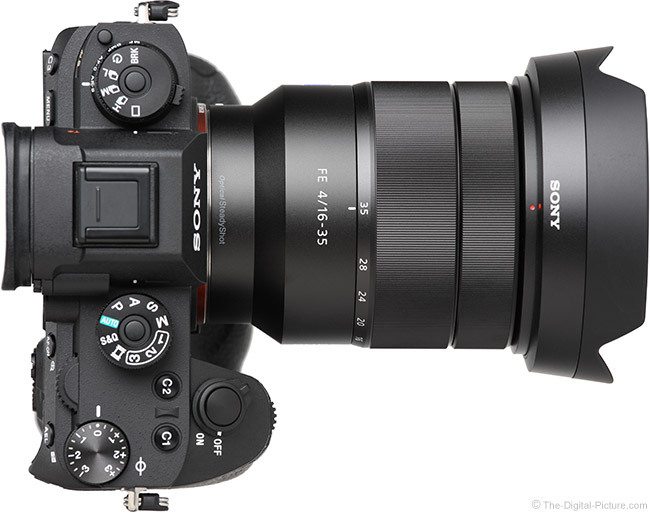 For many more comparisons, review the complete Sony FE 16-35mm f/4 ZA OSS Lens Specifications using the site's Lens Spec tool. Here is a visual comparison of three of the above lenses. Use the site's product image comparison tool to visually compare the Sony FE 16-35mm f/4 ZA OSS Lens to other lenses. This lens utilizes filters with a common 72mm thread size. While these are medium-sized filters, this size is smaller than the alternative 16-35mm lenses. 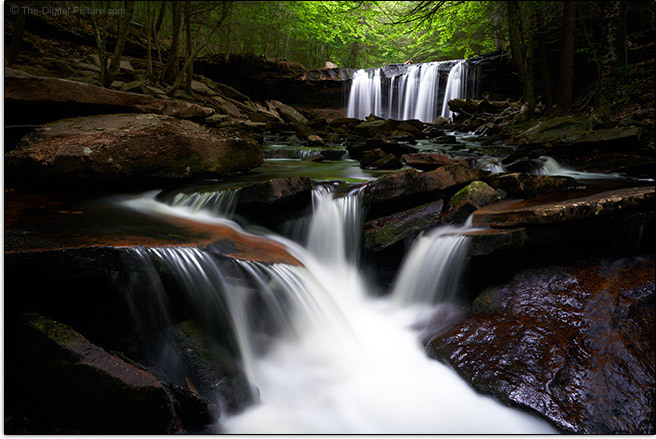 Take note that using a standard thickness circular polarizer filter will create strong mechanical vignetting in frame corners at the widest angles. A slim model such as the B+W XS-Pro is very highly recommended. The included Sony ALC-SH134 lens hood has a petal-style, yet with plenty of flat surface provided, the lens will easily sit upright balanced on the hood on a flat surface. This is a compact hood, though still quite protective and definitely worth using. This quite-rigid hood is plastic and metal-constructed with a rubber-coated end and a matte interior to avoid reflection. A seemingly-good-quality soft vinyl draw-string pouch is also included. 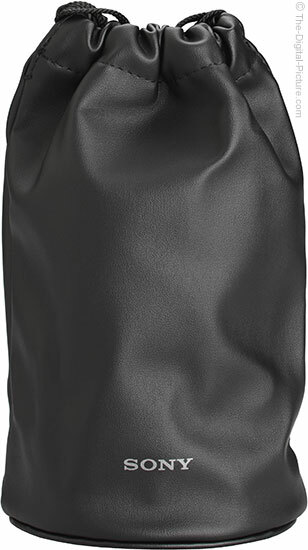 This modestly-oversized pouch has a padded bottom, but the felt interior offers only minimal impact protection. Get a Lowepro's Lens Case for that. 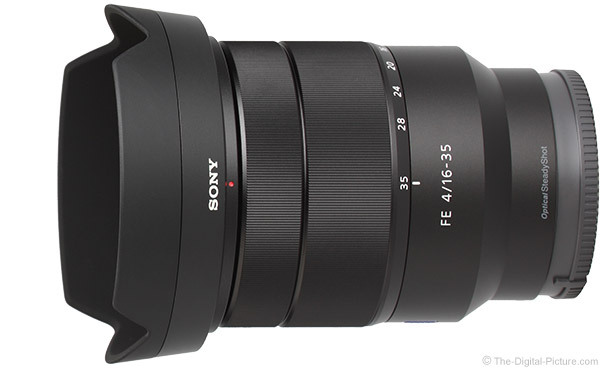 Like the other Sony-Zeiss FE lenses, the Sony FE 16-35mm f/4 ZA OSS Lens gets a moderately-high price tag. The difference is enough higher than the Canon and Nikon alternatives to catch attention, but ... perhaps you found the Sony camera less expensive and, in that case, the overall cost is somewhat balancing. Still, this is a high quality lens and worthy of a similarly-high price. 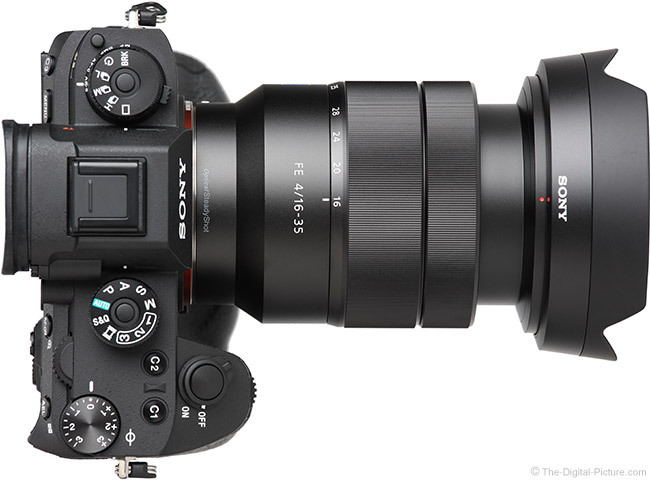 As an "FE" lens, all Sony E-mount cameras are compatible, including both full frame and APS-C sensor format models. 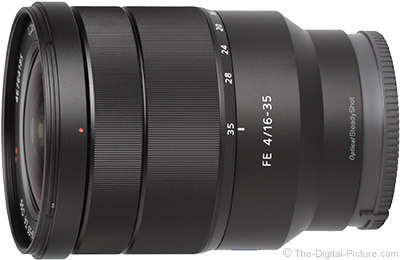 The reviewed Sony FE 16-35mm f/4 ZA OSS Lens was online-retail sourced. For Sony camera owners, the Sony FE 16-35mm f/2.8 GM Lens is the most-likely alternative to the Sony FE 16-35mm f/4 ZA OSS Lens. Obviously, the f/2.8 lens has a 1 stop wider aperture to its advantage, letting in 2x as much light. In the Sony 16-35mm f/4 vs. f/2.8 Lens image quality comparison (at f/4), the f/2.8 lens is slightly sharper in the center at 16mm and 20mm f/4 and the f/4 lens is slightly sharper in the corners. The f/2.8 lens center of the frame advantage grows slightly at 24mm and more than slightly at 28mm. At 35mm f/4, the f/2.8 lens turns in a far better performance. These differences are minimalized at f/5.6, but the f/2.8 remains a much better choice at 35mm. Of course, the FE 16-35mm f/4 has one significant feature that the f/2.8 model does not – built-in stabilization – which can certainly swing the image quality results in favor of the f/4 lens under certain shooting conditions. The Sony 16-35mm f/2.8 vs. f/4 Lens specifications comparison shows some of the differences between these lenses including size and weight. While the f/2.8 lens weighs 5.7 oz (162g) more, that difference doesn't seem big for the aperture difference. The size difference appears more in line. Along with the larger body size, the f/2.8 has larger filter threads (82mm vs. 72mm). The f/2.8 lens has an 11-blade aperture while the f/4 lens has 7 blades. The price difference seems even larger than the size difference and this will be a significant factor for many. If you need the wider aperture or want stellar wide aperture image quality at 35mm, the f/2.8 lens is the one you want. 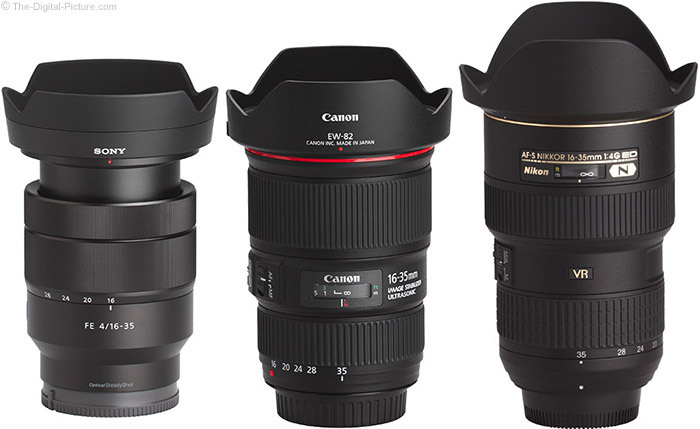 For those willing to use a lens mount adapter, the Canon EF 16-35mm f/4L IS USM Lens is an excellent consideration. The Sony FE 16-35mm f/4 OSS vs. Canon EF 16-35mm f/4L IS Lens image quality comparison shows the Canon very slightly sharper in the 16mm f/4 center and the Sony being a bit sharper in the corner, though the Sony shows much stronger lateral CA. At 20mm, differences are hard to detect aside from the Sony continuing to have more lateral CA. At 24mm and 28mm, I like the Canon centers slightly better and the Sony's corners slightly better. The Canon rules at the Sony's weak 35mm setting. Differences are minimalized at f/5.6, except the Canon continues to outperform the Sony at 35mm and the Sony continues to have more lateral CA at the wide end. The Canon has less peripheral shading at the wide end, but more at 35mm and even stopped down, the Canon has somewhat less vignetting overall. The Canon shows slightly more flare effects at the long end, but it produces a nicer starburst effect. The Canon has more barrel distortion at 16mm but has less distortion over the balance of the focal length range. 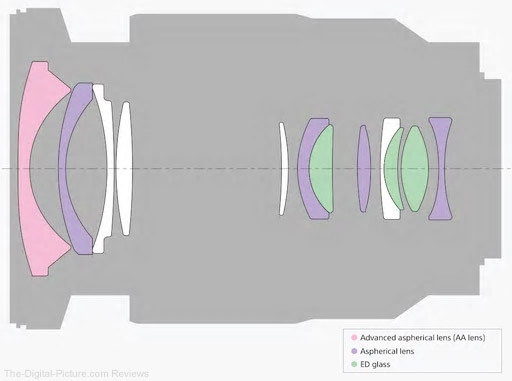 Comparing the Sony FE 16-35mm f/4 OSS Lens to the Canon EF 16-35mm f/4L IS Lens, we see the Canon having two additional aperture blades (9 vs. 7). Confirming what was seen in the earlier 16-35mm f/4 visual comparison, the Canon is slightly heavier and a bit larger. However, the Sony catches up in length to the fixed-size Canon when extended at 16mm. The Sony uses smaller filters (72mm vs. 77mm). These two lenses have the same minimum focus distance, but the Canon has a higher maximum magnification (0.23x vs. 0.19x). The Canon is less expensive, but when the cost of an adapter is factored in, that gap will be closed or potentially even reversed. 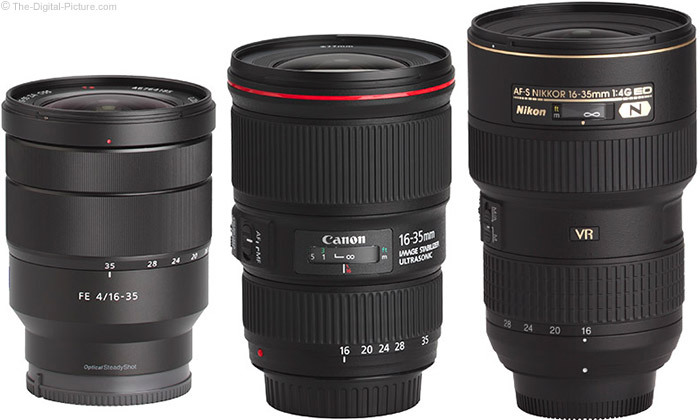 Use the site's lens comparison tools to evaluate other lenses you may be considering. What we learned in the Sony FE 16-35mm f/4 ZA OSS Lens review: avoid 35mm f/4. Perhaps Sony should have stopped short of the 35mm focal length, or at least made f/5.6 the max aperture at that setting. Also, you are going to want lateral CA correction enabled when using this lens. 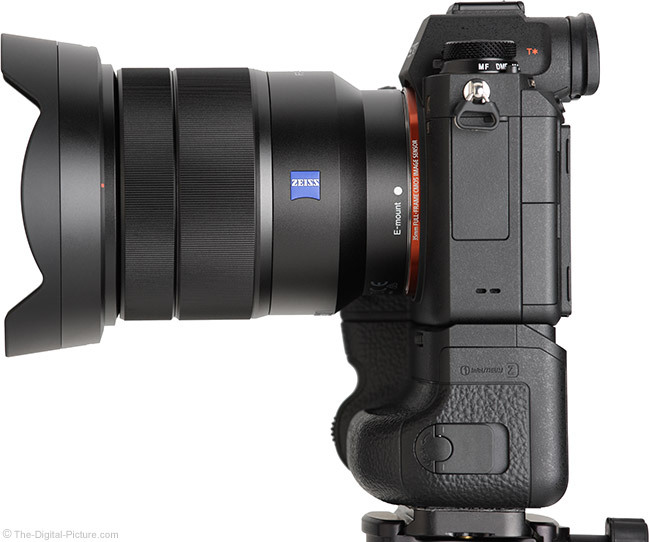 Otherwise, the Sony Vario-Tessar T* FE 16–35mm F4 ZA OSS Lens performs impressively. This relatively compact and lightweight lens looks great and has an especially nice design featuring a metal exterior. Great also describes the image quality this lens produces with very sharp images being the norm (below the 35mm focal length). The versatile focal length range and Optical SteadyShot make this lens usable for many scenarios and the moderate price tag places this lens within reach of a significant number of photographers. 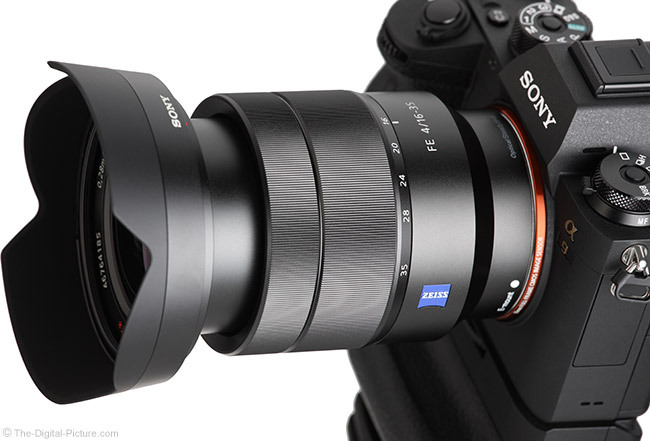 The Sony FE 16-35mm f/4 ZA OSS Lens fills a significant need for the compact Sony E-mount cameras. It is an excellent member of the Sony FE lens lineup and deserves serious consideration for your wide angle needs.